Love, Love Love these linen lamps. Very classy but adds a nice touch to your designs. The lamp pictures don't do it justice MUCH BETTER in person. Most definitely unique and stylish design. This user was entered into a sweepstakes after submitting their honest review. Safavieh Lighting 27-inch Faye Marble Table Lamp - White - 13" x 13" x 27"
Illuminate your space with a touch of contemporary style. 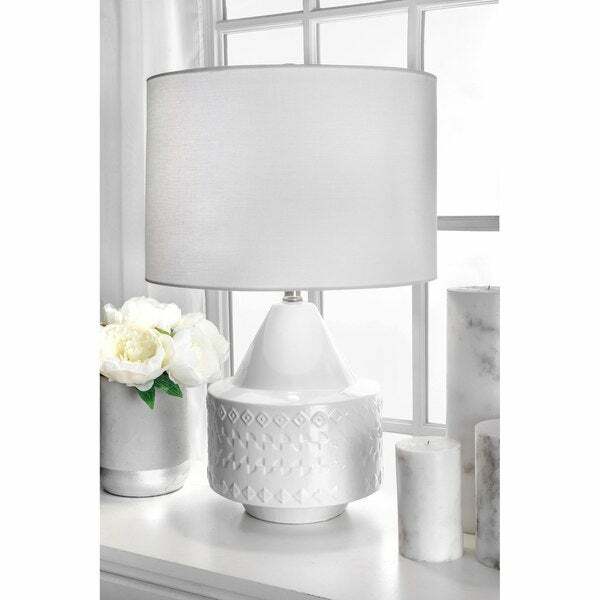 Warm and luminous, with a white vase base, this lamp will make a refreshing and stylish addition to your space. Love, Love Love these linen lamps. Very classy but adds a nice touch to your designs. The lamp pictures don't do it justice MUCH BETTER in person. Most definitely unique and stylish design. these finished the look of the master bedroom. They are short and solid so I don't knock them over when I go to turn them on. Love the look the brilliant white ceramic is a nice contrast to the silver walls. Would over them again. I love them. They are good quality and are the perfect addition to my master bedroom. "What are the dime signs of the shade?" Safavieh Lighting 19-inch Tucana Table Lamp - White - 10" x 10" x 19"